All radio devices like cellphones, radios, televisions, and Wi-Fi devices communicate via electromagnetic radiation. These man-made devices are not the only source of such radiation – the Earth’s magnetic field, the Ionosphere, the sun, and the universe in general all emit similar electromagnetic radiation, over an extremely broad range of frequencies. 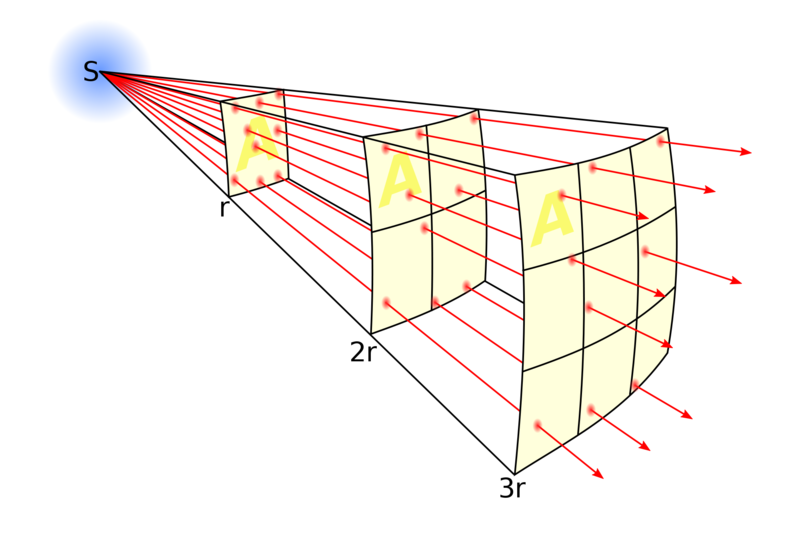 Electromagnetic radiation, which can be invisible like radio waves, visible like light, or felt like infrared heat, is subject to a law of physics called inverse-square. The quantity or intensity of any radiation is inversely proportional to the square of the distance from its source. The diagram below illustrates this principle. Just like when sitting around a fire, the closer a person is to the source of some radiation, the more exposure they will receive. The further away, the less exposure. Online news provider CNet tests the SAR of mobile phones on a regular basis and stores the results in a database, which was last updated in July 2013. The mean score of their top 20 lowest radiation phones is .32, and the mean of their top 20 highest radiation phones is 1.43. While cellular towers emit much higher power levels than cell phones, due to the inverse square law the amount of energy a person can absorb from them can be quite low. At ten meters, about as close as a person can get to a cellular antenna, the SAR of a 50 Watt GSM transmitter is .365, or just around the level of one of the lowest radiation cell phones on the market. Such cellular tower radiation levels have been judged by the Environment Court (Shirley Primary School v Christchurch City Council C136/98) to be so low that the risk of radiation to students from a cell tower to cause sleep disorders or learning disabilities would be “in the order of one in a million”, and that “there was so little evidence for an adverse health effect from RF emissions that it cannot be scientifically calculated as a percentage probability in small fractions of a percent”. Wi-Fi devices operate on power levels far lower than cell phone towers or Smartphones. While a cellular tower may emit 50 watts, a Wi-Fi router is restricted to 4 Watts or 1 Watt, depending on the frequency band in use. A recent study by the UK National Radiological Protection Board found that for a child in good signal range of a wireless router, the SAR at head level was 0.0057W/kg. With 5,407,000 mobile subscriptions as of 2012, New Zealand has more active cellular connections than people. Many of these connections, including all of Telecom’s nearly two million, are 3G connections that support data alongside voice. Smartphones were in the hands of 44% of subscribers by 2012, and most of those subscribers use data on them every day. Smartphones also make up 58% of all new phones sold today. One of the most common features of Smartphones is the ability to use data on Wi-Fi networks. When using Wi-Fi, the power levels absorbed by a user of a smartphone will be far lower than if the device is using 3G. From the research cited above, it’s clear that if you’re going to use a Smartphone or allow one to be used near you, the best way to minimise radiation levels is to ensure that Smartphone is using a Wi-Fi hotspot for its data. Calling for the elimination of Wi-Fi from public places or schools on the basis of a radiation hazard is entirely misguided and counterproductive to a goal of lessening absorbed radiation.